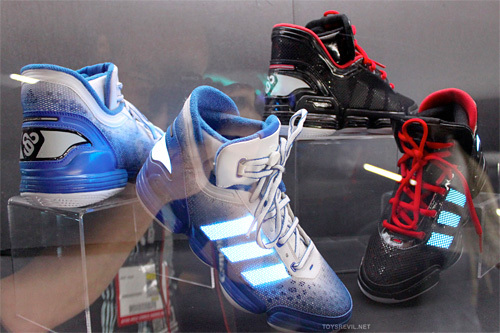 Adidas' TRON: Legacy Sneakers Revealed At Comic Con UPDATE: Now With Video! Now A Heck Of A Lot Cooler! | OhGizmo! Adidas’ TRON: Legacy Sneakers Revealed At Comic Con UPDATE: Now With Video! Now A Heck Of A Lot Cooler! A couple of weeks ago we posted about the Adidas TRON: Legacy tie-in sneakers that were first shown at Comic Con, but lamented that while the design was suitably futuristic and TRON-like, the fact that they only had glow-in-the-dark stitching and reflective screenprints was kind of disappointing. But the video above was posted to YouTube shortly after that article went live, and it clearly shows that the sneakers do indeed light-up by themselves thanks to some sort of electroluminescent material I’m assuming. So they’re definitely a heck of a lot cooler than I originally thought, and will no doubt be in high demand among sneaker freaks. Marty Mcfly is gonna sue somebody!